Today something brought from my weekly videos backlog, which was not possible to post here before. The latest revision from Jurgen Krooshoop's (Rhodeslover1) fully remote controlled Backhoe. Notice the image on the right is one magnificent render composition, made by Eric Albretch (Blakbird) as he has used us to. 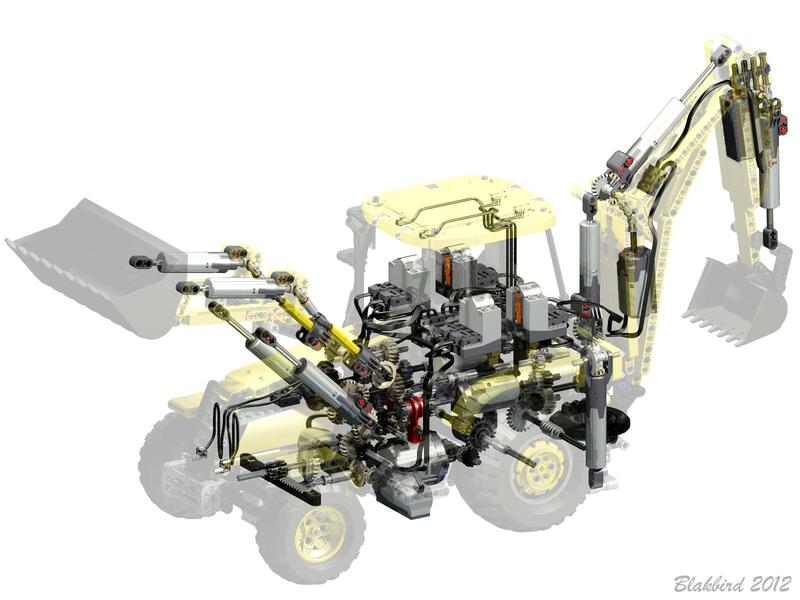 This Backhoe is the second revision and features 8 PF motors, for 9 functions. Below another couple of revolving renders, by Eric - Delightful! ...unfortunately they are not bigger. For additional photos, pictures and details from this Backhoe, you should access the respective page on Jurgens Technic Corner. There you will find out also how to obtain the instructions to build one. One first model with several functions still controlled via pneumatics (link). Based on JCB 4CX. The first version of the actual Backhoe, already without pneumatics (link). See Jurgen's website for the difference details to the actual version. That's a wonderful and yummyly complex model! Even though it is quite big, there doesn't seem to be any space wasted. As for TLG making an official PF remake of the 8455, I suspect the 8069 will be the closest we'll ever get: as we can see from Jurgen's creation, a wholly RC backhoe would have too many expensive components to make a marketable product.